After a successful and memorable 40th Anniversary of hot air ballooning in Iredell County, NC, National Balloon Rally Charities dba Carolina BalloonFest donated 60K to local non-profit organizations. American Cancer Society's Relay For Life of Statesville accepted $20,000. Our organization also recognizes the contributions of over 600 volunteers and dozens of event sponsors who contributed to the success of the 2013 event, including over 50 pilots and crews who journeyed across the United States to participate in the 40th Anniversary Celebration weekend. 2013 Carolina BalloonFest 40th Anniversary! Our Carolina BalloonFest 40th Anniversary 3-day festival was filled with many moments to remember! 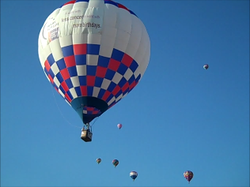 Pilots, families, friends and hot air balloon enthusiasts reunited to honor and celebrate our notable pioneers who took flight more than 40 years ago - their adventurous spirit gives us the wonderous gift of sailing in the winds, today! From 1974 to 2013 they gathered each year in our community to catch the winds and share their passion for flight with each other. 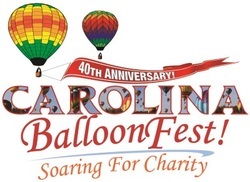 Their tradition continues... National Balloon Rally Charities thanks everyone who contributed their time and support to the success of our event, Carolina BalloonFest, which enables us to continue our charitable mission! Please revisit this page for more history, photos & videos from our celebratory year! Pilots of 2013 Celebrate our 40th! Statesville Civic Center... Our 40th Anniversary celebrated many aeronautic pioneers and notable community members who founded Iredell County's special place in hot air ballooning history!